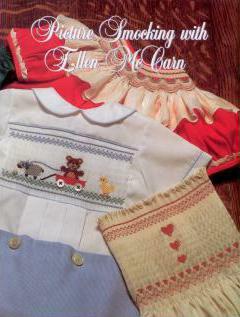 With 32 pages of beautifully illustrated instructions, the color booklet covers beginning through advanced smocking and includes sections on pleating and construction advice. 150 step-by-step illustrations, photographs and 7 designs make this volume a must for both student and accomplished smocker. 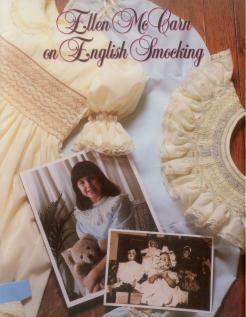 The Guide for beginners in English Smocking, this teaching guide contains six designs, a pillow pattern, and eyelet and lace collar instructions. 7 pages. This 4-page booklet has 2 versatile designs for yoke (or hand bag) and round neck garments. Suitable for all seasons by changing the dominant color, this booklet has detailed instructions and graphed alphabet. 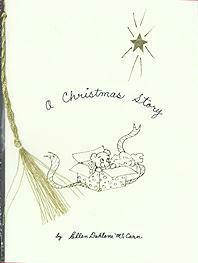 "A Christmas Story", written and illustrated by Ellen McCarn, is a 32-page story about a little teddy bear watching and participating as two children go through the preparations and joys of the holiday season. A parallel story follows on every other page, simultaneously progressing to their discovery of the true meaning of Christmas - the Ultimate Gift. The drawings and handwritten copy are in their original format to preserve the feeling of a simple and unaffected message. 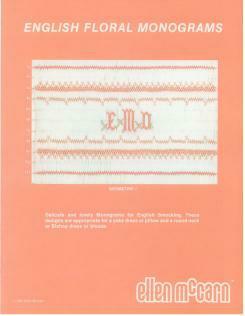 The "keepsake" first edition is printed on fine, cream-colored, durable and coated cover-stock paper. The cover features a precious little gold foil-stamped bear sitting in an open gift box gazing at a star, which is die-cut and overlays fly page with decorative, gold-stamped stars. The spine is die-cut top left with a small hole, through which an elegant handmade metallic floss tassel is attached. Individually packaged in a clear plastic bag to preserve it's appearance. 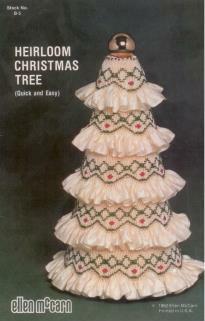 Enjoy this charming smocked Christmas tree in ecru or other ribbon colors. 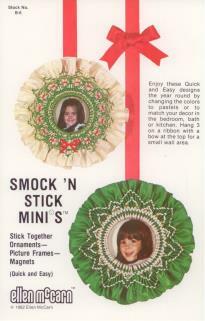 The pictured tree is 6" tall, and the instructions have a chart for figuring out ribbon yardage for larger or smaller trees. Detailed instructions for pleating single-face satin ribbon are included. Enjoy these quick & easy designs year 'round by changing the colors to pastels or to match your decor in the bedroom, bath or kitchen. Hand 3 on a ribbon with a bow at the top for a small area. Detailed instructions for pleating single-faced satin ribbon are included. 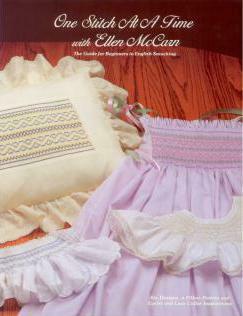 I have actually just received your book "Ellen McCarn on English Smocking". I plan to devour it! Thanks!